What Are the Stages of Life for a Baby Blue Jay? Considered obnoxious and raucous by some people and beautiful and intelligent by others, blue jays (Cyanocitta cristata) are common large song birds found throughout much of North America. About 9 to 12 inches long with blue bodies and black and white bars on their wings and tails, these crested birds are ground feeding, sometimes migrate and often form lifelong mating bonds. 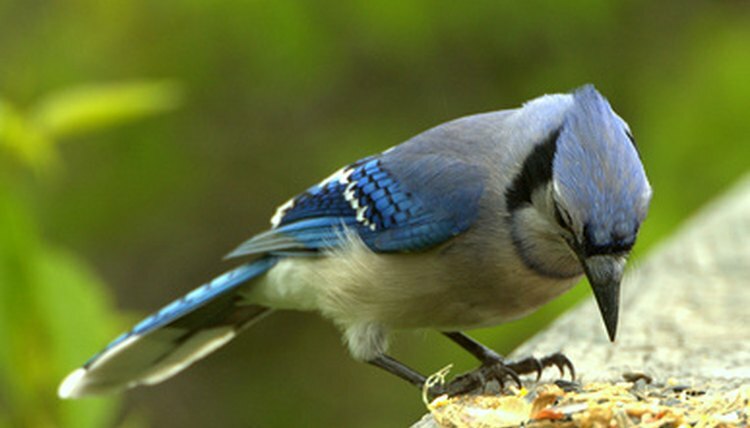 Baby blue jays undergo several stages of development before leaving their parents' care. Female blue jays typically lay three to seven eggs (usually four or five) in a nest made of twigs, grass, mud and rootlets, according to the Cornell Lab of Ornithology. The eggs range in color from greenish buff to blue or yellow. Eggs incubate for 17 to 18 days, during which time the male primarily collects food for himself and his mate while the female sits on the eggs. When the eggs hatch, the baby blue jays are limp and helpless, naked of feathers and have closed eyes. The female broods the nestlings for the first 8 to 12 days while the male gathers food. After this time, the male and female share in food gathering, foraging for insects and worms and even injured or dead vertebrates such as frogs or mice, as well as the nuts and seeds that make up a large part of their diet. During the nestling stage, the babies' eyes will open, they become stronger and some of their feathers will emerge from their sheaths. Blue jay broods usually leave the nest together when the babies are about 17 to 21 days old. The young will work up to a distance of about 75 feet away from the nest by the end of their second day out. They remain with and are primarily fed by their parents for another four to eight weeks. Sometimes baby blue jays will practice wandering up to 15 feet from the nest a few days before the whole brood leaves together. These birds are often mistaken for "abandoned" baby blue jays, but are best left alone or returned to the nest. By this time, the juvenile blue jays look similar to the adults, but their heads are not crested and they tend to be more gray and white, with less blue or black coloring.